TCPTUES97--Can We Have a Little Spring Already? Well, our 12 and a half inches of snow sure didn't last long! It was 41 degrees today and it helped to melt practically all of it away. Our snowman out front has no more face and he's leaning to one side, trying hard to stay alive. He was made of snow, but the children know he'll be back again some day. Good to know. Anyway, I'm getting back into the swing of things here after being out of town all day on Saturday and then Sunday was spent doing last minute projects for the Dirty Dozen gallery. I can't believe it's my last month! It went by so fast! :( I managed to make my SFYTT card and throw it in there as well since I didn't have one for ya'll this past weekend. Go check it out if you're a Fan Club member. So it's Tuesday and that means another TCPTUES challenge from The Cat's Pajamas. This week is a color challenge (TCPTUES97--Olive, Lt. Blue and Ivory) brought to us by Joanne. We hope you get to play along! She's got all the details as to how to play on her blog HERE. There's $25 in Cat Cash up for grabs! For my card, I made a frame from a scalloped square Nestabilities and cut an Oval out of the center of it for my little birdies to peek through. They are from the set, Beans and Bunnies and Peeps, Oh My! and the sentiment is from another fabby spring TCP set, Spring Fling. I just thought these colors looked springy and I'm ready to hurry it along! I'm sure making spring cards will help. Maybe if I send one to the local weathergirl? Please? 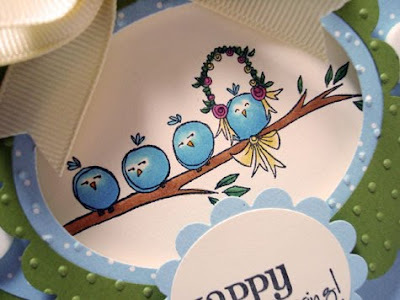 SUSIE Q-TIP: Cut an oval in half and have it peek out from the sides of a main panel on your card. They could also peek out from behind the top and bottom or all four sides (with 2 ovals). Awww how adorable! I love the little birds! 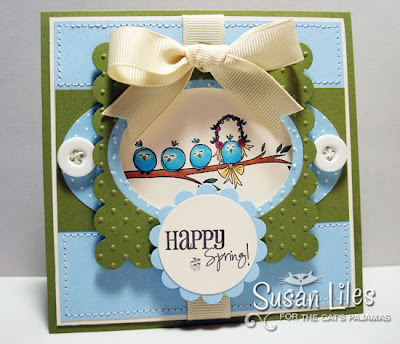 great card, I really like the layout you have with the ovals! Glad to hear your snow is almost gone too - we are having a few issues with melting snow ourselves. Only downside is we are hosting the Winter Olympics and need to make sure the events occur!!! 56F for a high today isn't helping things - ugh! May have to run a downhill on the grass LOL! Love this! So springy and cute! This card is gorgeous! I love everything about this card! Susie!!! I LOVE, LOVE, LOVE this card. The little birdies are soooooo very cute!!! I, too, am ready for Spring to be here!! This card just makes that desire even stronger!!! I love the card so cute! I agree with with can we have a little spring. I live in Florida and we have been COLD!! !